One your iPhone 4S, you can use the Music app to create your own playlists, and you can search for an item in your Music library by using the Search feature. 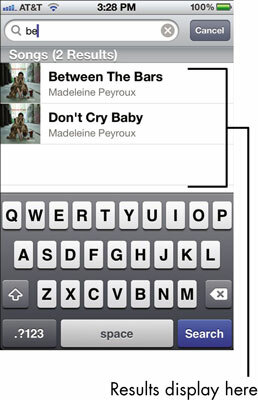 1Tap the Playlists button at the bottom of the iPhone screen. 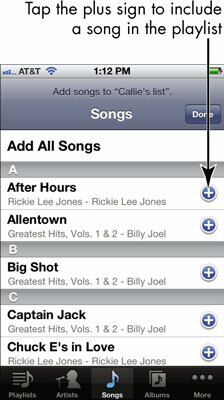 You can create your own playlists to put tracks from various sources into collections of your choosing. 3In the list of selections that appears, tap the plus sign next to each item you want to include. 4Tap the Playlists button to return to the Playlists screen. 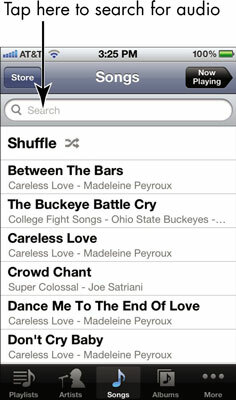 Your playlist appears in the list, and you can now play it by tapping the list name and then tapping a track to play it. 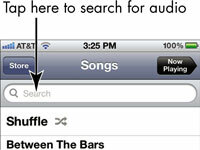 5With Music open, tap the Songs button and then flick downward on the screen to reveal the Search field. 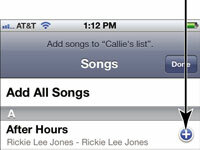 To search for a song in your music libraries, use the Spotlight Search feature. From your first Home screen, you can swipe to the right (or tap the first magnifying-glass icon to the left on any home screen) and enter the name of the song. It should appear in a list of search results. 6Tap in the Search field that appears at the top of the screen. 7Enter a search term in the Search field. Results are displayed, narrowing as you type. 8Tap an item to play it. You can enter an artist’s name, an author’s or a composer’s name, or a word from the item’s title in the Search field to find what you’re looking for.